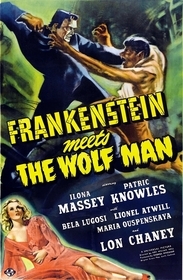 From the first bubble of the elixir that forms the credits in chemical smoke to the last crash of the final battle of titans, Frankenstein Meets the Wolf Man is quite a treat for the Universal fan. Not only do you get two exciting monsters for the price of one, but they're placed in a vigorous storyline that, while slight, is too much fun to dislike. Poor Larry Talbot (Lon Chaney, Jr.) has two problems - one, he's a werewolf, and two, he's not allowed to end his miserable existence. Even the seemingly fatal blow at the end of The Wolf Man didn't kill him, and now he's doomed to wander the earth. What's a lycanthrope to do? Why, seek out Dr. Frankenstein, of course. Unfortunately, the good doctor is out -- permanently -- but he's left his able-bodied monster (Bela Lugosi) behind to help. Gosh, this is going to go swell, with zero complications from would-be mad doctors or meddling villagers, right? The one thing that makes FMWM work better than its immediate contemporaries is its more-down-to-earth feel. Whereas the majority of Ghost of Frankenstein takes place in a laboratory/chateau, this film's main action is within the town of Vasaria itself. The addition of every-tortured-man Larry Talbot means that the villagers no longer have to act as simple superstitious archetypes, but can be infused with more life, more blood. This is given the most play during the Festival of the New Wine, where, for the first time in a Frankenstein film, we can observe the villagers actually celebrating and having a good time. It's a welcome sight and gives the viewer a delightful feeling of connection. Adding to said connection is Chaney as Talbot, bringing real pathos to an otherwise light-hearted creature feature. Chaney's offerings in the world of Universal horror have varied in quality (okay, most of them have been fairly lame), but Talbot is the role he was born to play - a man haunted by a curse he can't escape, mocked by those who could help him. In many ways, he's a modern day Cassandra, bringing tidings of woe to those who cannot believe him. The only difference is, he's usually the ill fortune that befalls those he warns, and they usually come around eventually. Lugosi's Monster is about as stiff as Chaney's was in Ghost, with a staggering gait and arms akimbo. It's harder to blame him, though, because Universal took the knife to FMWM, cutting out key scenes that reminded the audience that the Monster was now blind due to the ending of Ghost. Lugosi played the part accordingly, and then was robbed of the context for his performance. Still, he makes some pretty lazy acting choices, and one wonders if he doesn't consider the whole thing to be beneath him. Ilona Massey and Patric Knowles round out the cast as Elsa von Frankenstein and Dr. Frank Mannering, two people seeking to help Talbot. Since they're both very pretty people, they're naturally given to a little romance, although it's mostly limited to Elsa cowering in Frank's arms. Cleverly, though, screenwriter Curt Siodmak collapses the obligatory mad doctor role into the romantic lead, thus compressing the amount of time needed for both love and science. Also, this move gives the relationship a very natural tension, as Elsa von Frankenstein wants nothing to do with those crazy monster-raising types, while Frank becomes fascinated with the better life-creating through electricity gig. Speaking of electricity, Frankenstein Meets the Wolf Man contains my favorite electrical doodads by far. Whirling spirals and Jacob's Ladders the size of a Port-a-Potty do that great crackling thing that makes any science scene in a Frankenstein film incredibly fun to watch. Indeed, these creations are as much the stars of the series as the Monster or the Frankenstein family, and should be recognized as such. Of course, the entire movie is just a lead-up to the final showdown between the Wolf Man and Frankenstein's Monster, and what a showdown it is! When they say knock-down, drag-out, no holds barred, they're talking about this. Scientific whirligigs get smashed; tables get thrown; fur goes flying. Then, due to one drunk vigilante villager and a case of dynamite, the whole thing becomes a battle between the title creatures and a raging flood. It's one of the most delightful scenes in a Universal horror film. Frankenstein Meets the Wolf Man isn't exactly a chiller, but it is an exciting romp through the previously established rules of Universal horror films. At this point, the monsters had lost their power to really frighten, and the studio was wise to stick them in more of an adventure storyline. It's a tale that's well-told and well-acted, and it's a must for Universal fans. Stuntman Eddie Parker is quite visible standing in for Lugosi on more than one occasion. Submitted by Maclenharistar (not verified) on Fri, 2011-06-24 15:08. One of my favorite Universal films, and couldn't agree more with the review! Submitted by maxfabien on Wed, 2011-10-12 20:03. 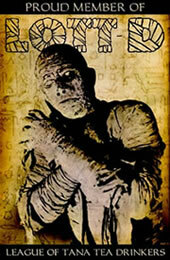 FMWM is truly a classic Universal monster flick, but it has several faults. The biggest one is casting Bela Lugosi as the Monster. Perhaps they thought it was a clever move cuz the in the movie's pedecessor, "Ghost of Frankenstein", the Monster received the brain of Ygor (also played by Lugosi), so this may account for the resemblance. Unfortunately Lugosi's own striking features takes away the suspension of disbelief, and the viewer knows he is watching Bela Lugosi, and not the Frankenstein Monster. The review states that much of Lugosi's scenes were cut, which would've explained how the Monster got his sight back. Why were they cut? The movie, as it is, is only 74 minutes long. Suely they could've left in a few extra minutes to clarify this oversight. Also, at the end of "Ghost" the Monster (played by Chaney) spoke with Ygor's voice (Lugosi). It seems that to keep the Monster speaking in FMWM would be a natural since Lugosi, as the Monster now, could actually speak in Ygor's voice. And one last critcism, Evelyn Ankers should've reprised her role from "Ghost" as Elsa. Ilona Massey was fine, but Ms. Ankers is "horror film royalty" and is second to none. Overall, it's a fun movie.